The property was designed by a local architect and the simplicity of the design with lofty, light filled interiors, enhanced by contemporary furniture and the bold use of colour creates an environment which is a joy to encounter. High ceilings and natural airflow keep the villa cool sustained by the natural cement floors. Sunitha is happy to cook breakfast, lunch and/ or dinner for you, for a small extra charge (we suggest 1,200 LKR per day). All you need do is decide what you wish to eat, pay for (or buy) the ingredients. There are 3 bedrooms each with a super kingsize bed, additionally there are two single inflatable airbeds and a crib. The minimum stay is 3 nights, except between 11th December and 6th January when the minimum stay is 1 week. There is a supplement for weekend (only) stays, please enquire before booking. There is a supplement of £25 per additional person per night for more than 6 guests. There are no pets allowed. Smoking permitted outside only. Locals say that the water never looks the same and changes constantly depending on the weather, time of day and activities of the fishermen. Fish off the house paddle boat or simply sit on the jetty to marvel at the brilliance of the location. While Hikkaduwa beach (with excellent surf, diving and a variety of restaurants and nightlife) is a mere 10 minutes away (400 to 500 LKR single fare to Hikkaduwa, depending upon the time of day/night). We are Paul and Philippa Shepherd from Lincolnshire in the UK. We are married with 4 kids between us between the ages of 18 and 30. We built The Retreat on land sourced by our agent. Originally, it was to be our holiday home and we had no intention of renting it out, but had such wonderful comments from friends and family, together with an inability to get there more than twice a year, decided to take the jump. We are glad we did! We wished to build a "home from home", in a quiet and beautiful location and offering complete privacy, but close enough to facilities to have the best of both worlds. We think we achieved this! The best villa we have stayed in. Spacious, clean and wonderfully looked after. The villa was amazing. Spacious and furnished to a high standard. Lots of small touches, including the art work and carvings,which gave the villa a wonderful feel of being looked after. The villa is quiet and relaxing and is set in stunning surroundings. We were looked after from start to finish, from booking to airport transfers. Everything went to plan and ran smoothly. We were extended a warm welcome from Prem, Sunitha and the Hikkasurf team. Prem and Sunitha are a lovely couple, always on hand to help with questions and advice. 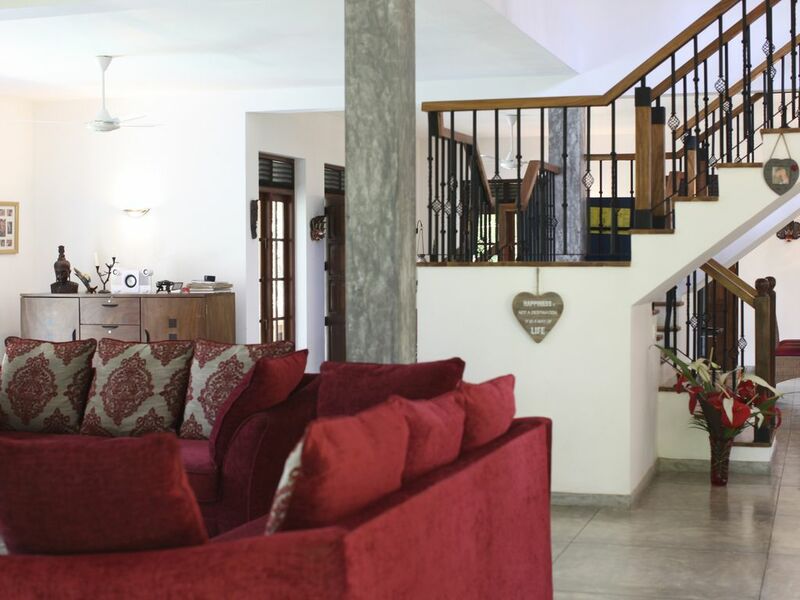 Sunitha’s curries are not to be missed and Prem is very knowledgeable about the wildlife.They tend to the villa, pool and grounds with care and attention. We loved getting out and about in the Tuk Tuks and seeing the sites. Two weeks was not enough and we are looking forward to coming back. Definitely a five star villa with a five star team. Thank you to all who made our holiday special. We stayed at The Retreat for a 2 week family holiday with our 2 boys aged 7 and 12. The villa was everything we'd hoped it would be and Sunitha and Preme looked after us so well. Sunitha took us to the local market and shops when we first arrived and prepared beautiful meals for us each day, firm favourites from our boys were the breakfast pancakes and string hoppers. Preme took the boys out on the Lagoon where they saw monkeys, lizards and birds. He was always on hand to take the boys wildlife hunting in the garden too. They were both great with our youngest son and really did help make his holiday extra special - he would have happily stayed forever especially if Sunitha continued to supply freshly made nutella pancakes! The palm squirrels running and playing around the garden are great fun to watch from the comfort of the pool side loungers and lots of other amazing wildlife come and go throughout the day. The drivers recommended for the villa were waiting for us at the airport and were fantastic throughout our stay. The trips we took were made all the more special because we had them along with us and they guided us to the best places and areas, making sure we had amazing experiences each time we were out. They even took us to their own garden to see monkeys playing in the trees. The WiFi access at the villa was a little hit and miss after a monkey pulled the wire down towards the end of the first week, it just never seemed to fully recover after that, a hazard of living in the jungle but the pool and wildlife kept the boys amused throughout the days when we weren't out and about and the boys were thoroughly impressed we had monkey visitors. We visited during the low season so a number of the cafes and restaurants nearby were closed but we found a few beach side places open and Sanji and team were great at giving recommendations. We cant thank everyone at The Retreat enough for ensuring we had an amazing family holiday, it was filled to the brim with memories we'll never forget. We wouldn't hesitate in recommending this villa to anyone, you are guaranteed to have an amazing holiday in this little piece of paradise. We picked The Retreat as a place to stay for some rest and relaxation after a fairly hectic 12 day tour of Sri Lanka and what an excellent choice we made. The villa is wonderful and has everything that you need for a great stay. The pool and gardens are beautiful and very well kept - an ideal place to relax and unwind and inside the villa is well decorated and has great amenities. We spent our days swimming in the pool, relaxing on the sun loungers, playing table tennis, reading books on the first floor balcony, taking a boat trip around the lagoon and in the evening watching DVD’s and listening to music. However what made our stay extra special were the wonderful Preme and Sunitha. Preme looks after the grounds and the swimming pool and will take you out in the boat if you want, whilst Sunitha is available to cook for you if you wish. When we arrived we were not sure what to do about meals, but after the first nights chicken curry we quickly made plans to enjoy Sunitha’s fantastic cooking for the whole five days. My husband has even taken a note of some of her recipes to try at home. They are a wonderful couple and we really enjoyed meeting them. The Retreat is about a 10 minute tuk tuk ride from Hikkaduwa and the villas drivers are available to take you out if you wish. We took a ride into Galle to explore for half a day which was very enjoyable. In a nutshell we felt that we were in a little piece of paradise for five days - it was wonderful experience. Plotos don't do the property justice. We had a fabulous 3 weeks being thoroughly spoilt by Sunitha and Prem. They kept the house, gardens and pool spotless. We went in low season so the nearest town of Hikaduwa was pretty quiet but there were still bars and restaurants open along the beach. Trips to Yala and also Galle and a boat safari were all great. We would definitely go back to the house and can't thank Sunitha and Prem enough for all their hard work and fabulous food. A beautiful villa with superb pool and delightful gardens. We have just returned from a wonderful holiday to beautiful Sri Lanka. We are a family of 5 - our children are twins of 13 and our youngest is 5. We spent the first week of our holiday at the The Retreat and what a glorious week we had. From the moment we arrived and were greeted by the wonderful Prem and Sunitha we began to relax. The children explored the fantastic gardens and within the first couple of hours had been introduced by Prem to water monitors, coconut squirrels and a vast array of exotic birds. Sunitha had prepared the most delicious evening meal - plates were scraped clean and we all agreed it was some of the most delicious food we had ever eaten! The week continued in much the same way. The pool was so inviting and the children spent many hours playing in it - our youngest managed his first few strokes unaided. Having sampled Sunithas food we decided to take full advantage and asked her to prepare all our evening meals - we gave her money to buy the ingredients and she encouraged me to take a trip to the local fruit and veg market which was a real treat! Breakfast was also wonderful - so much fresh, beautiful fruit and some we had never tried before such as dragon fruit! When we managed to tear ourselves away from the villa we ventured out locally to the beach (around 10 mins away in a tuk tuk), a local turtle conservation project, the Tsunami museum, Hikkaduwa and Galle among others - all great excursions organised by the staff. One evening Prem took the boys out onto the lagoon in his boat where they were treated to a tour of the fantastic wildlife. We were sorry to leave and vowed to return some time! Airport transfers optional. Team of drivers with tuk tuks (rickshaws) and two air conditioned mini buses for tours further afield.